Put a lid on shockingly cold hard seats. 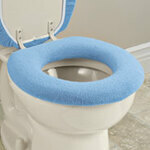 Toilet seat cover adds comfort and color to your bathroom! 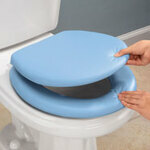 Soft toilet seat cover stays put with inner plastic rim. 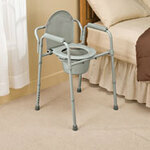 Fits standard rounds and oval seats. 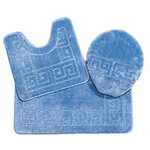 Machine washable fabric is 90% acrylic, 10% polyester; imported. 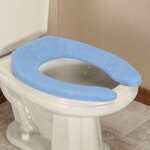 Stop the agony of sitting on a cold, hard toilet seat. Rest yourself on a soft-to-the-touch elasticized cover. Inner plastic rim keeps it in place as you rise. Elongated cover fits standard open-front oblong seats. Machine washable 90% acrylic/10% polyester; imported.